Scaling Leadership is the just-in-time guide for those in positions of senior leadership who need to transform their organizations. 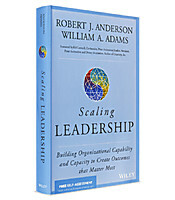 Drawing on a huge international database of senior leaders providing 360-degree written feedback to fellow senior leaders, Scaling Leadership distills lessons from successful leaders into a powerful and universal leadership framework that will let you chart your specific path of development. The meaning of the development gap and how to address it. Why scaling leadership can be achieved only by developing others. To transform Reactive leadership into Creative leadership.